I recently went back to my copy of Space Commerce by John L. McLucas because The Space Studies Institute has a project simmering called SSI G-Lab and I recalled there being some mention of related potential options. G-Lab is a free flying spinner at LEO planned to accommodate research on multiple generations of vertebrates at various reduced gravities – research that cannot be performed on the surface of the Earth because of the overriding 1 g. This is an important project because without it all bets are off when it comes to extended visits or permanent settlement of other planetary surfaces in the Solar System. We can ‘just go’ and find out when the first child is born but for a fraction of the cost and risk we could have some indication of the hazards and an easy place to test mitigation ideas. “One area of research where the tank may actually be better than the Space Station is in studying the effects of artificial gravity. Although we may not need to simulate 1 g, it is probably impossible to do so within the confines of the current Space Station Design; it is just too small. With a diameter of 15 feet, the largest centrifuge you can squeeze into the Space Station as now configured has a radius of about 6 feet. It is impossible to envisage getting useful results by putting a person in such a device. Such rapid spinning would upset the basic measurements on the effects of artificial g. The external tank, on the other hand, is large enough for a centrifuge of 12-foot radius. While still not ideal, this is much more workable. 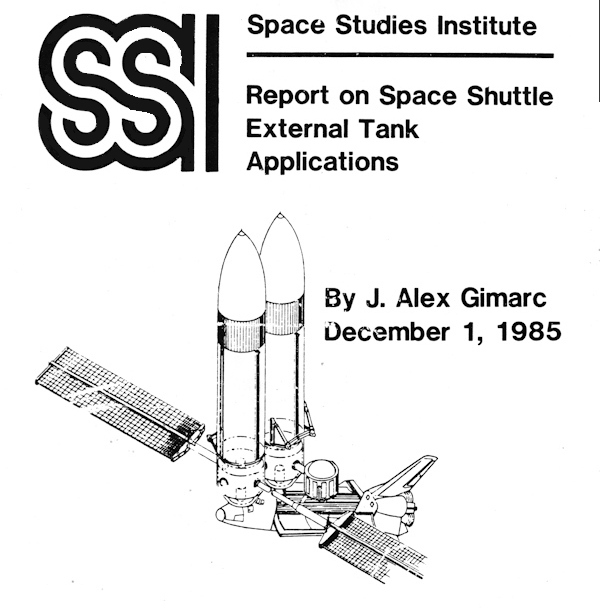 The discussion of using spent STS main tanks for artificial gravity testing goes on for several more paragraphs in both the section “The Shuttle’s External Tanks” and the following “Industrial Space Facility.” It is fascinating reading. “The use of tethers with the ET also provide significant advantages to the future space program. These advantages include artificial gravity, momentum exchange, electrical power generation, electric propulsion, and significant enhancements in shuttle and space station missions. Of course, the days of throwing away giant first stage tanks are behind us, landing them and re-using them is the current and potentially game-changing route. However, once the re-use technology matures beyond prototypes, when a tank has finished its run of launches there is a chance that a company would consider leaving it on orbit if someone could find a use for it in its final state. SpaceX’s use of “easier” to store RP-1 (kerosene) or methane means for a sticky inside and difficult cleanout but if Blue Origin or some other yet to appear company uses hydrogen with a helpful insulation system then a cleaner purge might be possible. How possible? In the end Skylab was launched “dry” as a facility built on the ground not “wet” and constructed in Space, it was simply less complicated, but we should be careful before completely ruling out the option if the day comes that launching is not as huge a deal as it was in the Apollo era – or still is today. Some motivator might come along to put a dual use tank back on the table and the bullet points in chapter seven of Space Commerce (plus the points made in The High Frontier and the SSI ET Report) may come around again as just those important needs. Reading a book on Space Tech from 1991 or 1988 or 1985 may seem to be a silly exercise, logic says that new books come out every year and new companies come along that completely re-write the fundamentals. Well, not necessarily. Space is definitely hot again with new players battling for bragging rights but overall it’s still a very slow moving business and old resources are where engineers go first not only to see if they can shave development time and cost but also to look for sell-able ideas that just were too far ahead of their time. With that in mind, The Space Studies Institute is proud to re-release the SSI Report on Space Shuttle External Tank Applications. We hope that you find in its pages some great ideas that can help us all reach The High Frontier. Click the link below for your free copy. note: do some quick searches for information on the SLS main tank. what is the size? what is the fuel? what and where is the insulation? interesting?